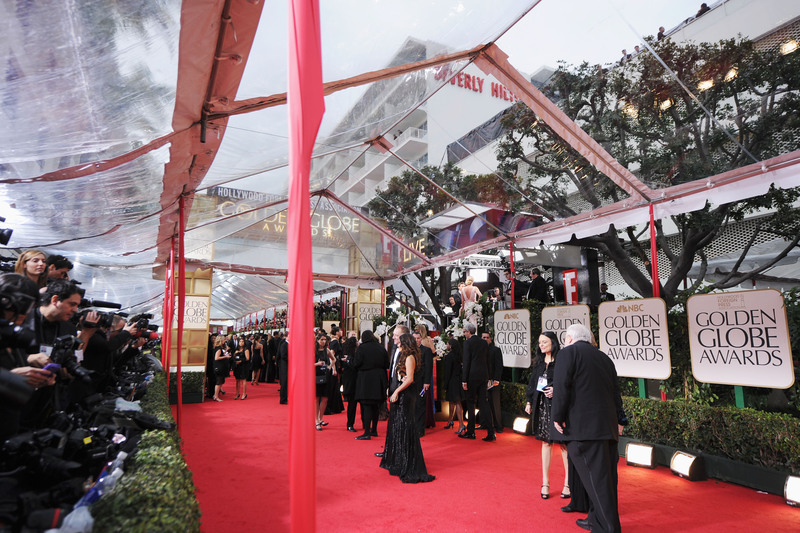 Yikes, things have already gone awry at the Golden Globes today. At approximately 12:20 p.m. (PT) on Sunday, a pipe at the Beverly Hilton Hotel, the award show’s venue, burst and flooded the red carpet where hundreds of celebrities will be strutting their stuff later tonight. Lights that set off an alarm system caused black sewage and water to drench cameras in addition to the carpet, according to The Hollywood Reporter. After a large light was placed in close proximity to a heat sensor, the sprinkler system went off, flooding the area for journalists with 5,000 gallons of water, according to USA Today. Although the Beverly Hills Fire Department arrived not long after the water spillage occurred, parts of the carpet had to be cut and replaced due to the damage. Irine Spivak, the public relations manager for The Beverly Hilton, released a statement soon after: “We can confirm that there was a malfunction with a sprinkler near the red carpet. The situation was quickly resolved. … As some of the biggest names in entertainment are scheduled to attend Golden Globe Awards tonight, we wanted to give the carpet one last wash before it opened.” Well, at least they've got jokes.